Walter Wainwright began growing Georgia peaches in the 1940s. What began as a 200 acre farm with a packing shed onsite in the Cromwell community of Taylor County has blossomed into an organization that spans several counties. In the 1950s, the second purchase of land expanded the farm to 600 acres. Shortly after, Walter Butler sold the family 1,200 acres of land. The peach packing operation was then moved to Pebble Packing Shed along Highway 96 and the railroad, which allowed a new venture – shipping peaches both by rail and truck. The farm packed peaches at Pebble until a fire destroyed the shed in 1962. The family rebuilt on the outskirts of Reynolds where it is still in operation today. In the fall of 1989, the farm was purchased by Jeff Wainwright, the grandson of Walter Wainwright. At this time the farm consisted of 1500 acres of peach trees. By the winter of 1992, the farm had planted additional trees and the farm had over 2500 acres of peaches. The farm now consists of over 3,000 acres of trees and 4 acres of strawberries. 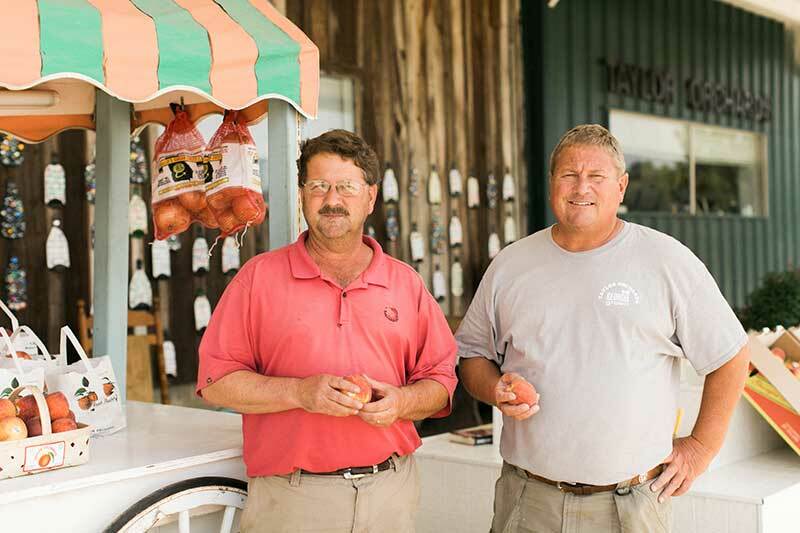 To this day, Taylor Orchards continues its longstanding family traditions while keeping up with the latest and most modern technology for the highest standard of growing and packing peaches. Taylor Orchards is registered with the FDA and has successfully completed and passed all requirements of Primus and GAP audits since the year 2003. Additionally, owners Jeff and Walter Wainwright have completed food safety courses through the Georgia GAP Food Safety Program. Taylor Orchards is a member of the National Peach Council, Georgia Peach Council, Georgia Fruit and Vegetable Growers Association, Eastern Peach Growers Exchange and has been listed as a top grower in the American Fruit Grower magazine since 1991.